For those wondering how long do cats live after being diagnosed with cancer, the answer depends upon a few factors. Approximately six million cats are affected by cancer each year and it is the leading cause of death in 32% of our feline friends. Unfortunately, cancer is not quite as easy to detect in cats as it is to detect in humans, because cats are not able to communicate when they are not well. There are some treatments that can help, but most cats will not live very long after getting a cancer diagnosis. To understand feline cancer better, let’s start by taking a look at the symptoms and potential causes. Unfortunately, no one even knows how humans get cancer thus far, and the same goes double for cats. Scientists have discovered that there are genetic factors at play, and that cats that are spayed or neutered after the age of six months are more susceptible to cancer, but otherwise there is no way to predict or prevent cancer in cats. You can look out for some of the warning signs, and if you catch them early enough, you may be able to help your pet. Some of those symptoms include sudden weight loss and especially a loss of appetite, spending more time than usual by themselves and not seeking out social situations, the bleeding of the nose or the gums, other oral issues like discolored gums, lumps and bad breath as well as any irregular discharge such as from the eyes or diarrhea. There are a few different types of feline cancer. The most common type of feeling cancer is feline lymphoma or lymphosarcoma. These affect the lymphoid cells within your feline and can lead to widespread problems throughout your cat’s body. 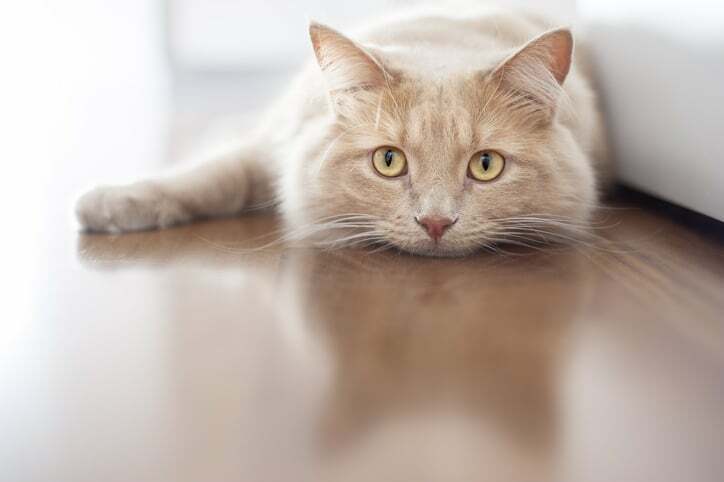 This type of cancer can lead to renal problems which means that your cat will have trouble processing toxins, may have gastrointestinal issues which will cause weight loss or weight gain and changes in appetite, nasal tumors which could result in nosebleeds is a dead giveaway for a serious problem in cats, brain and spinal problems, chest lymph nodes and multi-organ failure. Another type of cat cancer is called fibrosarcoma. Fibrosarcoma develops in the connective or fibrous tissues. Your cat may also be affected by skin cancer, cancer of the mammary glands or leukemia; which is cancer of the blood. The average length of time that a cat will live after receiving a cancer diagnosis is around two months. However, even if your cat is expected to live longer or was just diagnosed, your veterinarian may recommend euthanasia. That’s because your cat may be pain because of the cancer. Cats are unable to communicate their pain, and we are unable to manage it because of that, however when cat’s are in unbearable pain, they will cry out. In some cases your veterinarian may be able to access the tumor or perform treatments that will save your feline friend. Each situation is different. We always recommend our Advanced Immune Restoration Protocol, it’s highly effective and comprehensive. The combination of essential fatty acids and sulfur bearing proteins, both in our protocol, have been studied by world renowned biochemist Dr. Johanna Budwig, can super charge the immune system helping the body fight the cancer cells. This entry was posted in Cat Cancer and tagged cancer, cancer in cats, cat, cat cancer, cat cancer symptoms, cat cancer treatment, cats and cancer, feline cancer, natural medicine.